The only reason this album isn't higher on my list is because the numbers are really meaningless and interchangeable based on my mood. A couple of years ago, Royal Thunder's last album, Crooked Doors was my number 1. This year's WICK feels very much like a follow up to that album, not just because it's the next one they made, but because there is a sense of connected themes, lyrically and musically, that I can't help but think is no accident as the band has developed their artistry and point of view considerably over the past few years. While the album could be argued to be split in two sections with the more upbeat (relatively speaking) songs up front before going into the more introspective and moving tunes, this is by no means to suggest that it's not cohesive. One thing easily leads to another and everything is connected. There's a progression that makes sense and connects the songs to one another and possibly to the previous album. Maybe I read too much into it, but opener "April Showers" talk of "fifty pills in the wall" and closer, "The Well"'s final line "these walls will tear us down" feel like there's more than just a common word between them considering the overall themes of loss and isolation that appear in between those lines. Then there's the hymn-like ending of the final song that fans will recognize from Crooked Door's "Floor." The vaguely religious allusion and connecting of loss to ritual is haunting. As usual, the band is tight. Josh Weaver's riffs are complex enough to keep things interesting without losing the rock structure. These songs are not meant to be rousing anthems but there is a little bit of an 80s metal vibe going on through a couple of songs like "Sinking Chair" and "April Showers" that drives them into your being. And of course, Mlny Parsonz's vocals are beyond phenomenal. In particular, the ballad, "Plans" is a gut-wrenching and cathartic performance that feels like an open wound, finally getting some healing air after a past due bandage is removed. Overall this album may be a little more "mainstream" than any of their previous releases. But to me, that makes it even more daring, since they do this without losing any of their power or perspective. If anything, what I find is that the melodies lull you into what might be an easy, "radio-friendly" hard rock mood before taking an unexpected turn that illuminates the brilliance of the whole. A given note or chord might be more major than minor, but the band has figured out how to still imbue it all with their same emotional heft. This is an album that, like all of their work, gets you headbanging and pondering the pains of existence at the same time. 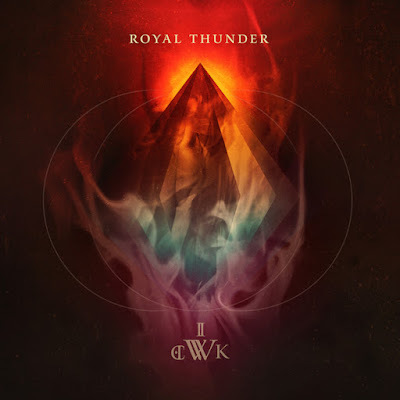 Royal Thunder is easily my favorite band of the last several years. I will buy anything they put out at this point, really. You should, too.